Indiannica Learning Private Limited (a subsidiary of Navneet Education Limited, formerly known as Encyclopædia Britannica (India) Private Limited) organized the Know For Sure Quiz at St Thomas School, Mandir Marg, Delhi on 23rd December, 2018. The quiz show was conducted by quizmaster, Mr. Titash Banerjea. More than 30 schools from in and around central Delhi participated in the quiz. The winning team was Modern School, Barakhamba Road, first runners-up were Springdales, Pusa Road, and second runners-up were Blue Bells School. 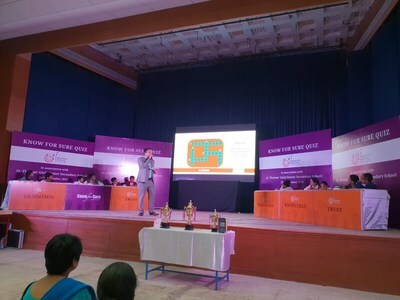 Six teams were short listed based on the written test and they faced each other at an exciting and interactive live quiz contest conducted by Mr. Titash Banerjea. Indiannica Learning Private Limited (a subsidiary of Navneet Education Limited, formerly known as Encyclopædia Britannica (India) Private Limited), since its inception in 2009 has been a pioneer in products that promote knowledge and learning. The company has an extensive product catalogue comprising specialized curricular learning solutions consisting of textbooks, interactive student and teacher resources, teacher training materials, educational, instructional, and information products as well as technology solutions. We strongly involve ourselves with schools, parents, and educators, designing products for the 21st century classroom and today’s home learning environments, while continuing our association with global educational publisher, Encyclopædia Britannica as exclusive licensee of Encyclopædia Britannica curricular solutions.